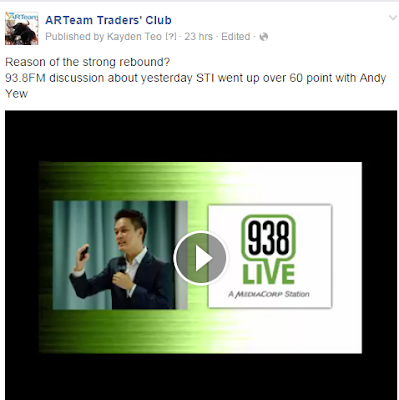 As mention on 938Live on wednesday, market has been strong since the Non Farm payroll last friday. A bad news on the employment become a good news of the delay of interest rate rise. This is a good time for those who have overloaded position to reduce the losses. Be prepared for next volatility to come when investor worries about interest rate again. If you are empty handed now, feel free to load up to 50% max. How you can prevent huge loss before a real big crash from stock market ? What should be the strategies now for current market condition ? There is huge opportunity to profit from bear market but you want to know how ? What Singapore and foreign stocks that are good and worth to watch out before you miss the boat ! How to get rid of your emotion using mechanical trading system ?